Saint Paul, well known as the Apostle of the Nations, or “Apostle to the Gentiles” (Romans 11,13, Galatians 2,8, 1 Timothy 2,7), has been almost all the time associated with the other big Apostle of the Church, Saint Peter. Except the period that both lived and preached in Rome, about the period of Nero’s reign as emperor, there’s possible that both met only twice in their lives and there may possible, that they hadn’t quite the same ideas about preaching the Gospel among the nations. But until coming to the point about the ideas and the mission of St. Paul, there’s also important to mention that he is the most important writer of the New Testament. If we try to calculate statistically, Paul wrote about one third of the whole canonical corpus of the New Testament, being followed by St. Luke with about one fifth, and the Saints John the Evangelist and Matthew, with some around one tenth each. Of course, the statistics are not very appropriate concerning the Bible, but they may show us about how much important is the teachings of St. Paul for our Church. There is also to mention the fact that, according to the new scholar researches, St. Paul would be the first to mention about the Last Supper and the words of Our Lord about the bread and the wine as His Holy Body and Holy Blood, in 1 Corinthians 11,23-26. The main source for historical informations about Saint Paul’s life is the material found in several of his epistles, such as Galatians and Romans and the Book of Acts, written by St. Luke, who may have been a mission-comrade to Paul. Even if the Book of Acts is after its twelfth chapter no more an Acta Apostolorum, but either an Acta Pauli, that writing tells us nothing about the Paul’s life after arriving Rome, or about his supposedly martyrical death. His original name Saul, in Hebrew Shaul, means “asked for, prayed for”, and was a regular name towards Israel. The usage of the name Paul comes first after his conversion, when he begins his first missionary journey into a new territory. Before his conversion, Paul may have been living in Jerusalem in the times when Jesus was convicted and crucified. Anyway surely he was among the ones who convicted St. Stephen to death, even if himself didn’t stoned him, but he just guarded the clothes of the ones who killed the first martyr (Acts 7,58 and 8,1). Paul himself confesses in the first chapter of the Epistle to the Galatians that he persecuted the church of God “beyond measure”, prior to his conversion. So his activity was a strong struggle against the ones who confessed that Jesus is Messiah. But even like that, the episode of his conversion makes us to believe that his “persecution” was not only a fight against, but also a personal searching of the Truth. Also his fury and his ambitious character, first exercised against the Church, provd to be changed by Our Lord into good qualities for preaching His Gospel. On the way to Damascus, where he was sent to imprison the Christians, Paul has a vision and Jesus Himself shows himself to him as a thunder of light (Acts 9,3). Paul hears a voice saying: “Saul, Saul, why are you persecuting me?” (9,4). There is important to mention, that the Latin word persequeris is noted in the Greek version with “διώκεις”. The verb διώκω means in the first understanding, to run swiftly in order to catch a person or thing, to run after someone, but metaphorically means to pursue, to seek after something eagerly. So the Words of our Lord may be understand also as “why are you running after me?”, discovering even to Saul himself that his struggle was in fact a running not against, but on finding Something, the Truth, the true Messiah. Paul’s conversion can be dated to the years 31 – 36, by the reference to his letters. After being temporarily blinded and cured by Ananias, an apostle in Damascus, Paul may have lived there for a while. Shortly he left in Arabia (Gal. 1,17), which was commented either as the Nabataean Kingdom, or symbolically as Mount Sinai, the mount of the visions. Here went to seek God both Moses and Eliah, the very ones who appear in the Transfiguration episode in the Gospels. There’s possible that here occurred the famous ascension of Paul until the third Heaven, that he mentions in 2 Cor.12,2-5. Also Paul mentions that he went back in Damascus and only three years later he met the Apostles. This information is important, because that says partly, that Paul didn’t take his Apostolate through the Preaching of the 12 Disciples of the Lord but from the Lord Himself (Gal. 1,12), and also, because there should be pass some years, so that the Apostles believe him that he is no more a simple Pharisee, a persecutor, neither a kind of traitor infiltrated inside the Church, but the very Apostle of Christ. 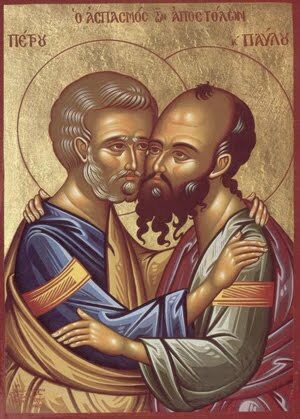 In the same epistle to Galatians, Paul states that he met Peter and stayed together with him for 15 days and he met also St. Jacob, the Lord’s Brother (Gal 1,18-19). Shortly after, he went to Antioch, where the followers of Jesus were first called Christians. From there Paul started together with Barnabas his first missionary journey among the people from Cyprus, Asia Minor, and Greece, which accomplished with a great success, founding new communities in Iconium, Listra and Derbe. 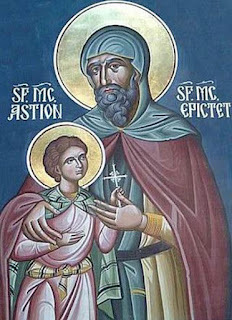 Shortly after his coming back in Antioch, the success of his mission had echoes, but the methods applied by Paul, without obliging the new Christians to respect the Jewish Law and customs, such as the circumcision, were quite strange to understand and to accept by the Palestinian community. So it happened the Apostolical Synod in Jerusalem, around the year 50. The decisions taken here were the ones applied already by Paul. The Christians are not obliged to respect the Jewish customs, if they were pagans before, but they must some minimal rules. Paul’s genius was obvious. In his epistles there’s quite clear that he respects the Jewish Law in which concerns its morality, but he refuses to accept the traditions and rituals, as unnatural for the New People of God. In this direction, the old and the new Christians, even if they differ in customs, language, traditions, they are the same: “There is neither Jew nor Greek, there is neither slave nor free man, there is neither male nor female; for you are all one in Christ Jesus” (Galatians 3,28). Even if the Council accepted the conversion of the non-Jews, Paul seems to have had a conflict with Peter. There is true, that Peter was an authority in the Church, but Paul doesn’t shy to attention him when he was wrong: being among the Christians in Antioch, Peter didn’t want to take the meal with the one not circumcised. Paul states that “when I saw that they walked not uprightly according to the truth of the gospel I said unto Peter before them all: If thou being a Jew livest after the manner of Gentiles and not as do the Jews why compellest thou the Gentiles to live as do the Jews?” (Gal. 2,15). This verse shows that Paul became an authority in the Church such as Peter or James or another among the Apostles. Paul leaves from Jerusalem for his second missionary journey, in the autumn after the Council of the Apostles. On their trip, Paul and Barnabas decided to separate, Barnabas taking John Mark with him, while Paul takes Silas. They travel to Tarsus, Derbe and Lystra. Here they meet Timothy, and later go to the western shore of the Lesser Asia. In Troy there’s possible they have taken St. Luke, because after this moment, the Evangelist refers as to the second person plural. Further, they go in Europe. At Philippi, Paul and Silas are put in jail, but after a miraculous earthquake, the gates of the prison fall apart and Paul and Silas are able to escape; this event led to the conversion of the jailor. They continued traveling, went by Berea and Athens where Paul preached to the Jews and Greeks in the Areopague about the “unknown God”, a masterpiece in the technic of oratory. In Corinth, Paul met Aquila and Priscilla who became faithful believers and helped Paul through his other missionary journeys. The couple followed Paul and his companions to Ephesus, and stayed there to start one of the strongest and most faithful Church at that time. In 52, the missionaries sailed to Caesarea to greet the Church there, and traveled down to Antioch to stay there for about one year before leaving again on their third missionary journey. Paul began his third missionary journey by traveling all around the region of Galatia and Phrygia to strengthen, teach and rebuke the believers. When he arrived in Ephesus, he stayed there for a little less than 3 years and performed a lot of miracles, like healing people and casting out demons. Then he went through Macedonia, Greece, and as he was getting ready to leave for Syria, he changed his plans because of the Jews who had planned a plot against him, and had to go back through Macedonia. He finished his trip in Caesarea, intending to go back in Jerusalem, in order to help the community here with supplies. In Jerusalem, the community there received him joyfully, but being in the temple for a prayer, Paul is recognized and beaten almost to death before being arrested by the Romans. That was his salvation, because he was a Roman citizen. Being kept as a prisoner in Caesarea for about one year and a half, he was transferred to Rome after his request and was released after the Roman commander realized that he was born a Roman citizen. 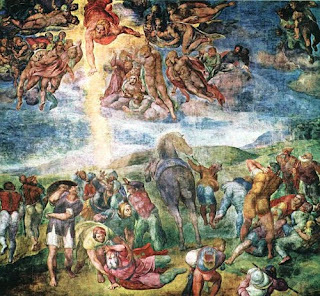 Paul and his companions went on to Rome, which was probably their last missionary journey, in 60. In this moment stops all the biblical informations about the Apostle. According to the traditions, Paul continued to preach in Rome and possibly traveled to other countries like Spain and Britain before he died as a martyr, probably also in Rome by beheading. This event has been dated either to the year 64, when Rome was devastated by a fire, or a few years later, in 67. Being a Roman citizen, he wasn’t tortured such as other Christians, and he wasn’t crucified as St. Peter. The tradition states that he might be executed in the same day with St. Peter, on 29th of June, during the persecutions ordered by the Emperor Nero. The early liturgical solemnity of Peter and Paul, celebrated on June 29, may reflect the day of their martyrdom. “… Are they ministers of Christ? I speak as a fool: I am more in labours more abundant in stripes above measure in prisons more frequent in deaths oft; Of the Jews five times received I forty stripes save one; Thrice was I beaten with rods once was I stoned thrice I suffered shipwreck a night and a day I have been in the deep; In journeyings often in perils of waters in perils of robbers in perils by mine own countrymen in perils by the heathen in perils in the city in perils in the wilderness in perils in the sea in perils among false brethren; In weariness and painfulness in watchings often in hunger and thirst in fastings often in cold and nakedness. Beside those things that are without that which cometh upon me daily the care of all the churches. Who is weak and I am not weak who is offended and I burn not. If I must needs glory I will glory of the things which concern mine infirmities. The God and Father of our Lord Jesus Christ which is blessed for evermore knoweth that I lie not...” (2 Cor. 11,23-30). Fourteen epistles in the New Testament are attributed to Paul, those being to the Romans, two to the Corinthians, to Gallatians, to Efessians, to Philippians, to Collosenes, two to the Thesalonicenes, two to his disciple Timothy, one to Titus, one to Philemon and one to the Hebrews. The importance of his epistles is unmeasurable and speaking about them, on may write entire libraries without finishing. 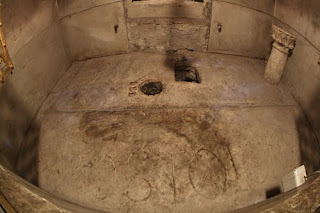 The Grave of St. Paul was, according to the tradition, under the altar of The San Paolo alle Tre Fontane church in Rome. 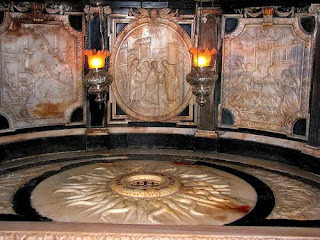 Another tradition holds that Paul was interred with Saint Peter at Catacombs by the via Appia until moved to what is now the Basilica of Saint Paul Outside the Walls in Rome. St. Bede, in his Ecclesiastical History, writes that Pope Vitalian in 665 gave Paul’s relics (including a cross made from his prison chains) from the crypts of Lucina to the King Oswy of Northumbria, from northern Britain. However, Bede's use of the word “relic” was not limited to corporal remains. In June 2009, Pope Benedict XVI announced the excavation results concerning the tomb of Paul at the Basilica of Saint Paul Outside the Walls. 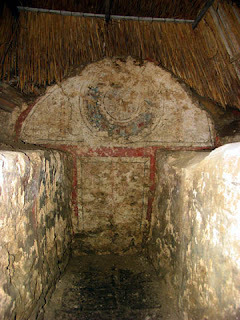 The sarcophagus itself was not opened, but was examined by means of a probe. It revealed pieces of incense and purple and blue linen as well as small bone fragments. The bone was radiocarbon dated to the 1st to 2nd century. According to the Vatican, this seemed to confirm the tradition of the tomb being Paul's. Saint Paul is the patron saint of London and of another many cities and Christian Communities around the World. He is almost always celebrated together with St. Peter and millions of Christians bear his name. The name Onuphrius or Onoufrios (Greek: Ονούφριος) comes from Egyptian, Wenn-nefer meaning “the always-good being”, an attribute to the Egyptian god Osiris. In Arabic, the saint is known as Abū Nufar, which, besides being a variant of the name Onuphrius, also means “herbivore”, also an hermit. St. Onuphrius is supposed to be lived as a hermit in the desert of Upper (southern) Egypt of Thebaida, in the 4th or 5th centuries. The most complete and wide “Life of St. Onuphrius” is written by Paphnutius the Ascetic, an Egyptian monk who encountered him after a long journey in the Egyptian desert. There is uncertain which Paphnutius is this author. He could be Paphnutius of Scetis, a 4th century abbot in the northern Egypt, named in the Apophtegmata Patrum or Paphnutius the Ascetic, named by St. John Cassian in his Dialogues with the Desert Fathers. Much about the early life of the saint is not known. A tradition states that Onuphrius had studied jurisprudence and philosophy before becoming a monk near Thebes, and later a hermit, that thing not being stated in the classical biography mentioned above. According to Paphnutius, the author of the “Life” undertook a pilgrimage into the desert, to study the hermits’ way of life and to determine whether he must live such a life or not. After 17 days of wandering in the desert, thirsty and tired, Paphnutius came across a wild figure covered in hair, wearing a loincloth of leaves. Paphnutius ran away to a mountain, because he was afraid of the strange vision, possible a demon, but the figure called him back, shouting, “Come down to me, man of God, for I am a man also, dwelling in the desert for the love of God”. This part of the story is quite similar with the Life of St. Mary the Egyptian and St. Zosimas, because the authors of the ascetic lives inspire themselves many from the same type of tradition, so they use the same literary motives (“topoi”). Turning back, Paphnutius talked to the wild man, who introduced himself as Onuphrius and explained that he had once been a monk at a large monastery in the Thebaida called “Erete”, but he later left it and lived as a hermit for 70 years, enduring the extreme thirst, hunger, and discomforts like heat during the days and coldness during the nights. After a while he was accustomed to this life. A miraculous palm tree grew near his cell, producing fruits 12 times in year (that is a clear account to the Tree of Life mentioned in the last Chapter of the Apocalypse). Also an angel came every Sunday and brought him the Holy Eucharist. Hearing about this story, Paphnutius forgets about hunger, heat, or even about the whole world, because he was symbolically in the “paradise” together with his new teacher. Onuphrius took Paphnutius to his cell, and they spoke until sunset, when bread and water miraculously appeared outside of the hermit’s cell. After the night spent in the prayer, when Onuphrius had completely turned into fire, in the morning Paphnutius knew that Onuphrius was near death, and God sent him here, in order to know such an extraordinary life. Paphnutius asked the hermit if he should remain in this cell after his death, but Onuphrius told him, “That may not be, your work is in Egypt with your brethren”. After blessing him, Onuphrius died, being the 16th day of the Egyprian month Paone. Due to the hard and rocky ground, Paphnutius could not dig a hole for a grave, and therefore covered Onuphrius’ body in a cloak, leaving the hermit’s body in a cleft of the rocks. After the burial, Onuphrius’ cell crumbled an the palm tree fell down, which Paphnutius took to be a sign that he should not stay. Onuphrius’ life is a typical life of the desert hermits or anchorites, in which the wonder-histories and the teaching are mixed in a pedagogical way, in order to help the monks to improve their personal but also comunitary life. Onuphrius’ cult spread across the Western Europe, Middle East, Eastern Europe and Russia. Both the Eastern Orthodox and Catholic Churches traditionally mark his feast day on 12 June (or 25 June for the Churches who respect the Old Calendar), the day of his death. 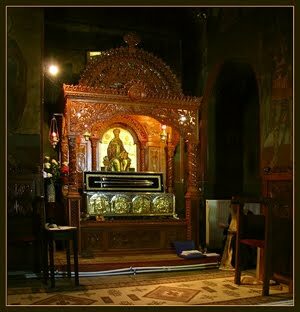 A part of his relics are situated in the church in Sutera, in Sicily, together with the relics of St. Paul the Hermit. In Rome, the church of Sant’Onofrio, was built on the Janiculan Hill in the 15th century. 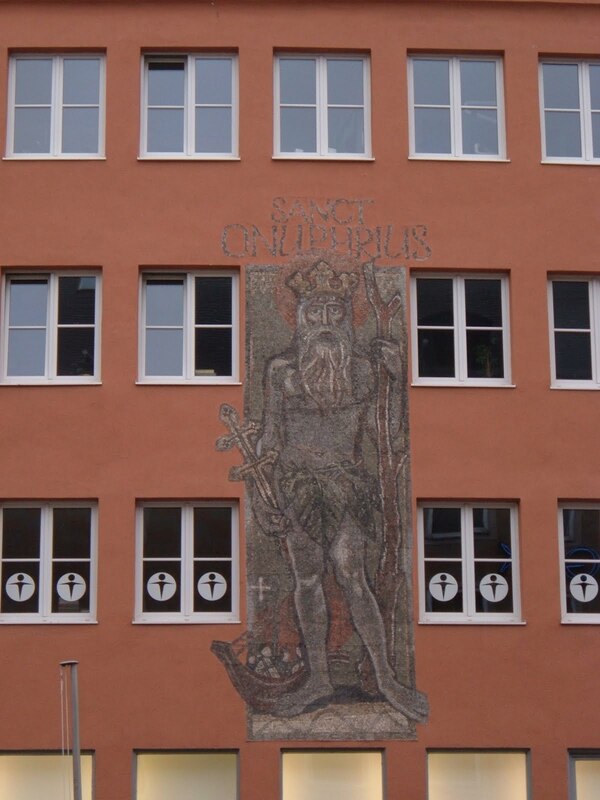 Saint Onuphrius is venerated in Munich, Basel, and in the all southern Germany. The Duke Henry the Lion (1129 –1195) of Saxony, and of Bavaria, the traditional grounder of Munchen and a big crusader, held St. Onuphrius as his patron saint. 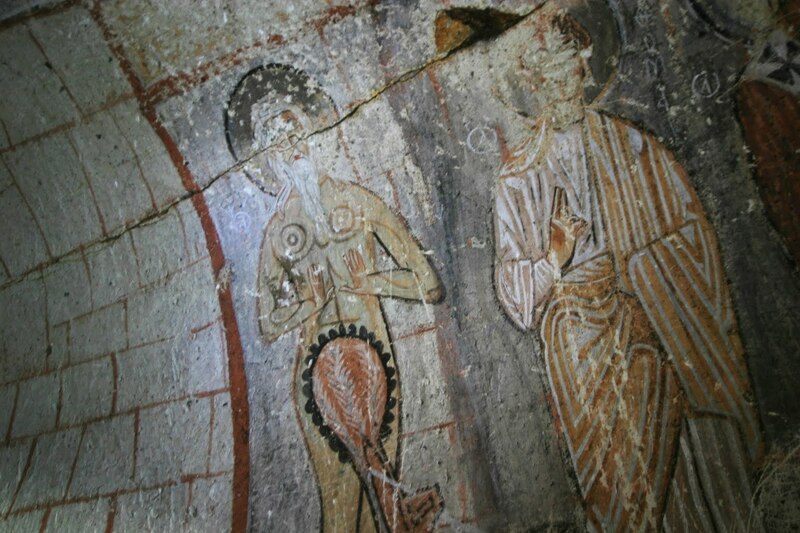 Images of Saint Onuphrius as “wild man" were painted in many churches after the Crusades. Usually he is depicted as a wild man completely covered with hair, wearing a girdle of leaves around his middle. 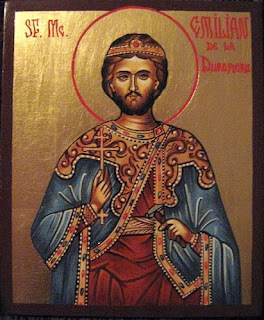 The archbishop Antony of Novgorod wrote around the year 1200, that Onuphrius’ head was conserved in the church of Saint Akindinos in Constantinople. 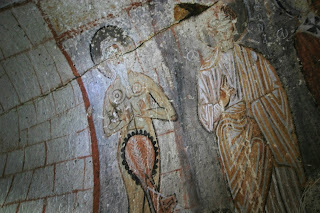 The Image of the Saint is depicted together with other anchorites at Yilanlı Kilise (or the Snake Church), in Cappadocia, already in the early Middle Ages. A monastery dedicated to St. Onuphrius is situated in Jerusalem, at the far end of Gai Ben Hinnom, the Gehenna “Valley of hell”, where according to the tradition is the location of Hakeldama, the place bought with the 30 dinaries of Judas Iscariot. 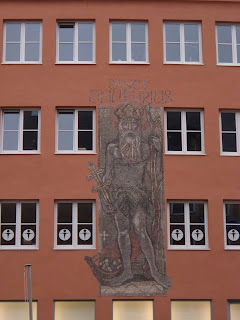 The cult of St. Onuphrius is strongly spread in the Eastern Poland, where a monastery dedicated to him was built at Jableczna, dating from at least 1498. According to the legend, after a big flood, the waters of the River Bug brought, on the place of the actual altar, the icon of the Saint. At the Feast of the saint, celebrated according to the old calendar (25th June), every year come thousands of pilgrims and traditionally the bishops celebrate the Holy Liturgy 4 times during the night, at the 4 churches of the monastery. There are in Poland also other churches and some monasteries dedicated to St. Onuphrius, both catholic (Bircza, 1422) or orthodox (Posada Rybotycka, 1367 and Perehinsk, now in Ukraine, 1400). In the flesh you lived the life of an Angel, you were a citizen of the desert and a treasury of grace, O Onuphrios adornment of Egypt. Wherefore we honour your struggles as we sing to you: Glory to Him Who has strengthened you; glory to Him Who has made you wonderful; glory to Him Who through you works healings for all. 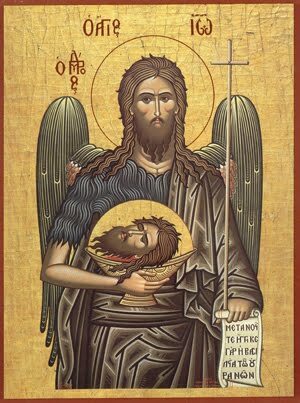 St. John the Baptist is one of the most important saint in the Christianity, known as the Forerunner Our Lord. The most important informations about him and his teachings are to be found in the Holy Gospels. There are also some other traditions and writings, which may be later dated. But an important accout about him comes from the Jewish historian Josephus Flavius. According to his report from Antiquities 18.116-19, stated also by Mark 6:17-29; Matt. 14:3-12; Luke 9, 7-11, the Jewish tetrarch Herod Antipas, who was from 4 B.C. until his banishment to Lyon in A.D. 39 a “quarter prince” over Galilee and Perea, had executed John the Baptist at Machaerus, his fortress high in the mountains east of the Dead Sea. This fortress lay at the remote southern end of Perea, on the east side of the Jordan, not so far away from the place called Betabara, opposite to Jericho, commonly known until today as the place “in the desert” where John began his work of baptism “across the Jordan” (John 1:28; 10:40). After this event, all his apprentices either went to Jesus and became His disciples, either went back to their homes. But why is John the Baptist a prophet and why Jesus called him as “bigger than the prophets and the biggest between the born from women” (Mt. 11,7-9; Lc. 7,24-26) ? Some informations about the importance of this person, who binds the Old and the New Testament, we can know if we study the episode about his birth, which both the Eastern and Western Churches celebrate on 24th of June, the (approximate) Summer Solstice. 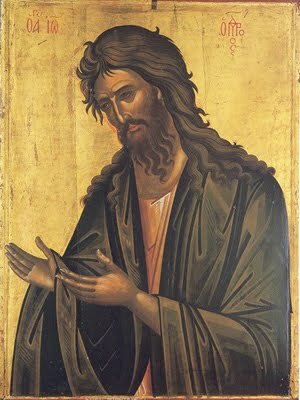 The biblical texts referring to St. John the Baptist are always situated at the beginning of the Gospels: because John is a Forerunner per excellentia. Of course, some other stories about him come later, until his death, mentioned above. In the Christian iconography, the Evangelist Luke is symbolized through a lion, and that’s because his Gospel begins with the prophetical text “The voice of the one who cries in the Desert: prepare the way of God…”, the text which is always associated with the ascetical life of St. John in the Desert of Judaea. Matter fact, this text, from Isaiah 40,3-5, comes by Luke only in his third chapter, precisely on 3,4-6. But the echo of John’s speaking is present from the beginning. So, Luke begins his Gospel not with a genealogy, but with the episode about the birth of St. John the Baptist. In the 1st chapter Luke tells that Zachariah, a priest from the Aaronite generation went to the temple and there he had a vision. An angel (Gabriel, the angel of the good news) came to him and told that he will have a son. Of course, Zachariah was astonished, firstly because of the vision and secondly because of the fact that he was already old, and his wife, Elisabeth, couldn’t have babies. According to the Jewish traditions, the couple without children was considered as cursed by God. The story later is well known: Zachariah doesn’t believe such a thing and asks for a sign, so that the Angel tells him, that he won’t be able to speak until the day when he will put to the child his name. After that, the priest gets out from the temple and the people there understand that he have seen something exceptional, because his face was changed and he couldn’t communicate but through the gestures. So Zachariah goes home, and after a while Elisabeth gets pregnant. In the meantime the same angel goes to Mary and tells her about the future birth of Jesus Christ, “The Son of God” (Luke 1,35). Later Mary goes to her relative, Elisabeth, and there happens a miracle: “And it came to pass, when Elisabeth heard the salutation of Mary, the babe did leap in her womb; and Elisabeth was filled with the Holy Spirit, and spoke out with a loud voice, and said, 'Blessed art thou among women, and blessed is the fruit of thy womb” (Luke 1, 41-42). The prophecy of the angel is being reality: John is full of Holy Spirit from his mother’s womb, being the first confessor of the divinity of Jesus. 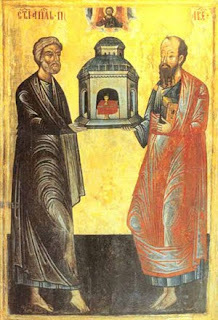 Another interpretation of his “leap” in the womb is that, John makes his first reverence in front of the Lord, showing that a prophet is smaller than the Son of God. After a while, Elisabeth gave birth to the child and the relatives came to see the wonder. The Gospel says that they wanted to name him Zachariah, like his father, but the parents opposed strongly. They chose surprisingly the name John, and then Zachariah could speak again. The name of John, in Hebrew, Johannan, means “God is gracious”: He is Merciful with his people, sending him such a prophet. After the birth, Zachariah sang a Hymn which is partly a prophecy about the future coming of the Messiah (Luke 1,67-75), and partly about the child John himself: “And thou, child, Prophet of the Highest shall thou be called; For thou shalt go before the face of the Lord, To prepare His ways. To give knowledge of salvation to His people in remission of their sins, Through the tender mercies of our God, In which the rising from on high did look upon us, To give light to those sitting in darkness and death-shade, To guide our feet to a way of peace” (Luke 1,76-79). Already the prophecy of Zachariah tells us the role and the importance of John. He is called for the first time as a prophet of the Highest, the one who goes before the face of the Lord. Those things tell even John about himself: “'I am a voice of one crying in the wilderness: Make straight the way of the Lord, as said Isaiah the prophet. And those sent were of the Pharisees, and they questioned him and said to him, Why, then, dost thou baptize, if thou art not the Christ, nor Elijah, nor the prophet? John answered them, saying, 'I baptize with water, but in midst of you he hath stood whom ye have not known, this one it is who is coming after me, who hath been before me, of whom I am not worthy that I may loose the cord of his sandal. '” (John 1,23-27, Mt. 3,11; Lc. 3,16; cf. Mc. 1,7-8). He is only the one who prepares the people for the coming of the Lord. His baptism is only a symbol of the repentance for the ones who were waiting for Messiah. Finally, about the childhood of John we don’t know much, only that “the child grew, and was strengthened in spirit, and he was in the deserts till the day of his showing unto Israel” (Luke 1, 80). The Christian tradition says that shortly after the event of his birth, Herod began his persecutions against the children around Jerusalem and Bethlehem and so Elisabeth and the child ran in the desert. In some circumstances Zachariah was killed. Shortly after, Elisabeth dies and John remains alone in the desert, being cared only by God Himself and His angels. So, being about 30 years old, he comes near the river of Jordan and begins his preaching about the shortcoming Kingdom of God. Some other implications of his baptism and his teaching we will leave for another article concerning the Saint Prophet. Here we will stop only about another thing, and that is the confession made by Jesus about John. That happens in an episode, when John sends to Jesus some of his disciples to ask if he is Messiah, or if they must wait for another. This question is quite strange, after the miraculous events occurred earlier in the river of Jordan (The Epiphany). Anyway, Jesus answers indirectly, showing him the wonders happened: “Having gone on, report to John what ye saw and heard, that blind men do see again, lame do walk, lepers are cleansed, deaf do hear, dead are raised, poor have good news proclaimed; and happy is he whoever may not be stumbled in me” (Luke 7,22-23). Immediately after, Jesus speaks about John: “What have ye gone forth to the wilderness to look on? a reed by the wind shaken? but what have ye gone forth to see? a man in soft garments clothed? lo, they in splendid apparellings, and living in luxury, are in the houses of kings! 'But what have ye gone forth to see? a prophet? Yes, I say to you, and much more than a prophet: this is he concerning whom it hath been written, Lo, I send my messenger before thy face, who shall prepare thy way before thee; for I say to you, a greater prophet, among those born of women, than John the Baptist there is not; but the least in the reign of God is greater than he.' And all the people having heard, and the tax-gatherers, declared God righteous, having been baptized with the baptism of John” (Luke 7,24-29). In this confession Jesus states clearly, that John is neither a zealote (“reed shaken by the wind”), nor an essenian (“a man in soft clothes”). Even from here we understand that John is not politically engaged. He doesn’t wait for a political Messia, who will free the Jews from the Roman occupation. John is neither an essenian, even if until today some scholars make lots of parallels between his baptism and the ritual bathes from Qumran. Even living in the desert, John is a prophet, in the way that Eliah was. During those time were already a lot of people who believed that John isin fact Eliah who came back in the World. That happened because John was preaching and baptizing at Betabara, the place where, according the tradition, Eliah went to heaven. 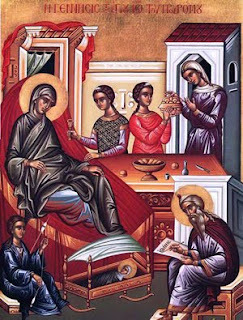 Jesus says more about John, that he is the greater born among the women, a one who prepares the Ways. One more thing is to say. St. John the Evangelist mentions in his third chapter, that even Jesus started to baptize, not him directly, but his disciples. So happened that the people around started to question about that and went to John, saying about someone “stealing his practice”. Apparently Jesus took John’s “copyright” without permission. “…And they came unto John, and said to him, 'Rabbi, he who was with thee beyond the Jordan, to whom thou didst testify, lo, this one is baptizing, and all are coming unto him.” But John, being aware of his mission says: “ no man is not able to receive anything, if it may not have been given him from the heaven; ye yourselves do testify to me that I said, I am not the Christ, but, that I am having been sent before him; he who is having the bride is bridegroom, and the friend of the bridegroom, who is standing and hearing him, with joy doth rejoice because of the voice of the bridegroom; this, then, my joy hath been fulfilled. 'Him it behoveth to increase, and me to become less; he who from above is coming is above all; he who is from the earth, from the earth he is, and from the earth he speaketh; he who from the heaven is coming is above all…” (John 3,26-31). John is aware of his mission. He knows that he is only a man, the one who prepares the way. From the moment of the Theophany, Jesus must increase, and John must become less, because the history of the Salvation is written so. Nothing human can put God in shadow. In a mysterious way God fix the historical fact with the very astral things. If the Natalis Domini is celebrated on 25th December, around the Winter Solstice, the smallest day of the year, the Birth of St. John the Baptist is celebrated on 24th June, around the Summer Solstice, the longest day of the year. After this Feast, the days are becoming less, exactly like St. John himself. The very Nature becomes lesser and lesser, waiting for the Rise of the Sun of Justice, Jesus Christ, our Lord. There are some opinions that the both Feasts of Natalis Domini and Natalis Iohanni are in fact not the very days of their birth. The Church fixed those dates around the 4th century, in order to overlap two big feasts in the Graeco-Roman pagan calendar, that is Dies Solis (25th December), respectively, Dies Dianae (midsummer), a Feast of the vegetation and fertility. That may be true. In the popular Romanian calendar, the Feast of St. John is known as Sânziana (Sancta Diana), or Drăgaica (from the Slavic root drag, meaning love), a statement that there were mixed two popular traditions, the Roman and the Slavic, both stating the importance of the Middle of the Year. This feast has an important role in prophecing the future of the year and even the future of the members of the comunity. Only the plants collected in that day have the best curative qualities. There are hundreds of traditions and practices with a clear pagan connotation. But that mustn’t be a scandal for the Christians. The very nature works together with God for our own salvation and Christ had prophets also among the pagan nationalities. St. Gregory “the Teacher”, a recently canonized saint in Romania, lived a monastic exemplary life and at the same time he was a loving man of culture. Due his activity, the movement of the revival of monasticism (known as the “philokalic” movement, or “neo-patristic”) was spread in the south of Romania, through the translations of patristic works into the local language, which is Romanian. Moreover, he revived the Romanian elements in the Church worship, supporting the printing of the liturgical books in Romanian. He was born in Bucharest, in 1765. His parents have supported his high education in the classical and spiritual sciences. Gregory showed an extraordinary intelligence, being the best student of the College of Saint Sava, the best Romanian school of his time. There he studied Latin and Greek, Theology, Grammar and other sciences. During his studies at the College of Saint Sava, he met the monks Gherontie and Dorotheos, two of the disciples of St. Paisie from Neamţ, the Abbot who started the revival of the monasticism in Romania and Russia in the late eighteenth century. At that time, Moldova and Wallachia were two romanian separate states, under the Turkish rule, Gregory being Wallachian. In 1790, St. Gregory came by himself at Neamţ Monastery, situated in the northern part of Moldova, where he was a direct apprentice of Paisie Velichkovsky, who tonsured him as a monk and taught him the rules of monastic life. In the monastery of Paisie lived at that time several hundred of translators and copyists, who influenced the spiritual life in Moldova, Wallachia and Russia for more than a century. Among them, being well acquainted with Greek, St. Gregory has translated various works of the Church Fathers, encouraged by Paisie. In 1796, Dositei Filitti, the Metropolitan of Wallachia (Walachia) has specifically requested two translators from Neamt Monastery. The monks Gherontie and Gregory were chosen by their Abbot for this mission and so they began printing in Bucharest, in 1799 the “Useful book for the Soul”, which is popular even today in the Orthodox space, being a kind of catechism. In 1801 the two monks were printed “the Kiriacodromion” of the Greek Scholar Nikiforos Theotokis, which explains the text of the Evangelical readings in the Sundays throughout the whole year. In the meantime, the Metropolitan of Moldova, Veniamin Costachi urged them to translate “The pious mystery of our orthodox faith”, printed in 1803, and “Interpretation of the Gospels” of St. Theophylact of Bulgaria, published in 1805. In 1806 it was printed the translation of the “Dogmatica” (“Teaching of the true Faith”) of St. John Damascene, an essential book of theology from the 8th century. In addition, the monk Gregory has translated and published some other books in Romanian. In 1812, St. Gregory and Gherontie went together to the Holy Mountain (Mount Athos), to “worship God in the holy monasteries there and to meet with parents for the benefit of the pious soul”. On their return, near the city of Plovdiv in Bulgaria, they were attacked by robbers, and Gherontie died due the cruel beating. Gregory retired to Căldăruşani, near Bucharest, for five years between 1818 and 1823, until his election as Metropolitan of Wallachia. Here he translated in Romanian some very important books for the candidates for the priesthood, namely: “Treatise on the priesthood” of St. John Chrysostom and “Word for the priesthood” of St. Gregory the Theologian. In 1822, after 110 years, it was elected a Romanian of Wallachia, namely Grigore Ghica. He supported the election of a new Metropolitan in Bucharest, in a time when there was no bishop in Wallachia and after a difficult war with the Turks. Elected as metropolitan, Gregory took firm balanced and full of wisdom decisions concerning the revival of the spiritual life of his country. He managed to ban the Greek bishops in the south of the Danube to ordain priests outside their diocese. That practice was quite “normal” in the Middle Ages, so that many priests knew almost nothing about their own faith. After a complaint addressed to the Patriarch in Constantinople, this practice stopped. At the decision of Metropolitan Gregory, many schools were provided with books and the best teachers were brought in to teach. Gregory knew that cultural and spiritual progress are mutually reinforcing, so he helped many poor students to study and tried to build theological seminaries, for the good preparation of the future priests and teachers. Above all, he tidied up the monastic life, trying to reestablish the rules of the Church Fathers in Romanian monasteries. After the outbreak of new conflict between Russia and Turkey in 1828, Gregory was forced to flee to Chisinau. In 1831 the Government in Bucharest required his resignation, but Gregory refused, saying: “God gave me a soul and a diocese, then I will leave the diocese when the soul will get out of my body, because these are things that concern the salvation of the souls”. It was only on 22 August 1833 he returned to Bucharest, but he lived only one year more, passing into eternity on June 22, 1834. He was buried sitting in a chair, in a vaulted tomb near the Metropolitan Cathedral in Bucharest. Over seven years, his bones were moved to Căldăruşani Monastery. His will may be found in the preface to the translation of the book “the Wheat-Sharing” of Saint John Chrysostom: “Only so much I desire to live, in order to help the Orthodoxy, my people and my brothers, so that they can easily acquire the eternal goodness through the teachings of the saints”. Gregory “The Teacher”, venerated already for a long time in Bucharest and around, was officially canonized on May 21, 2006, his feast day being on June 22, the day of his passing away. The Holy Synod of the Romanian Orthodox Church has approved this decision in the October 2005 work session, at the proposal of the Metropolitan Synod of of Muntenia and Dobrogea (which is the Metropolis of Wallachia). The relics of St. Gregory are currently in the Căldăruşani Monastery, where he himself spent five years between 1818 and 1823, until he was elected metropolitan. The Land of Scythia Minor, the actual Romanian region of Dobrogea, situated between the Danube and the Black Sea was one of the first Christianized regions in the world. The popular traditions say that St. Andrew the Apostle, in his way from Greece to Scytia (the today Ukraine) went through this region, where he would have stayed a few years, preaching the Gospel to the Dacians, Scythians and the Greek colonists from the cities here. The attestation of the early Christianity here is also recognized through the archeological discoveries. A few dozens of churches from the 2nd-4th century show the intensity of the Christian activity here. Beyond the rich traditions about the Andrew’s preaching here, there is not much known. It is possible, that the Christianity would be preached here peacefully, also because the Dacians, the ancestors of the Romanians, the dwellers here were already monotheists. Anyway, at the end of the 3rd century and the beginning of the 4th there are registered some strong actions of persecutions in the area, in the periods of the Emperors Diocletianus (284/305), Licinius (319-324) and later in the times of Julian the Apostate (361-363), respectively of the King Athanaric of Gothia (about 370-372). More than a dozen of soldiers, priests or simple citizens were killed because they confessed their faith in Jesus Christ. About those saints martyrs there was not very much to know, only a few notes in some Synaxaries. At 4th of June, the Syriac Martyrologium indicates only the Feast of St. Philip, but the “hieronimian” Martirologium, adds here the names Zoticus, Atalus, Eutichius, Camasis, Quirinus and other 28, unnamed. These saints were almost forgotten, but they came one more time in the attention after an event which passed about 40 years ago. In the summer of 1971, after some rich rainfalls, some locals from the small village of Niculitel, known much more because of its vineyards, discovered in a landslide some ruins. After more digging, it was obvious that there are not only some ruins, but an entire crypt built like a small chapel. 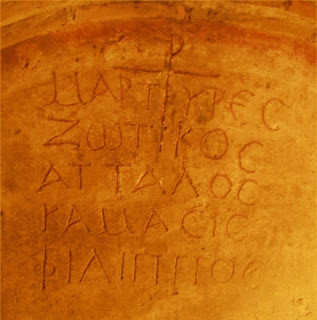 Inside of it were the bones of 4 men, put into a wooden coffin, and above it were on the walls 2 inscriptions in Greek, painted in red colour: “Martyrs of Christ”, respectively “Martyrs Zotikos, Attalos, Kamasis, Philippos”. Both inscriptions were accompanied by the sign of Chrismon (XP), an old Christian symbol. Even if the discovery occurred in the middle of the communist era, it made sensation between the archaeologists, historians and theologians. The crypt confirms the notation about some martyrs with those names, included in the synaxaries mentioned above and into an extended Greek synaxarion, together with other 32 more Christians who died in Scythia Minor, in the Old Noviodunum, a port at the Danube, not far away from the Danube Delta (the actual Isaccea). The historians believe that they died during the persecution of Licinius (319-324), or Julian the Apostate (361-363). About the other 32 there is no more informations. Only the 4 Saints Zotikos, Attalos, Kamasis, Philippos were buried here. Because of the barbarian migration that occurred beginning with the 4th century, probably the church, which was initially built over the crypt, was destroyed, and the crypt itself, situated under the altar, was covered with rests which protected it for more than 1500 years. 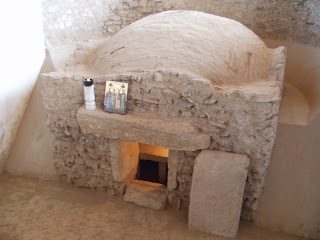 The archaeological researches discovered 2 more rooms, under this crypt, where there were found the bones of 2 more martyrs. The way those bones were found, made the specialists to believe that also these were martyrs. In the earth found, there were 2 offering vessels and a piece of sandstone with the inscription: “here and there the blood of the martyrs”. The 2 martyrs may be some earlier, maybe from the persecution under Decius (249-251). 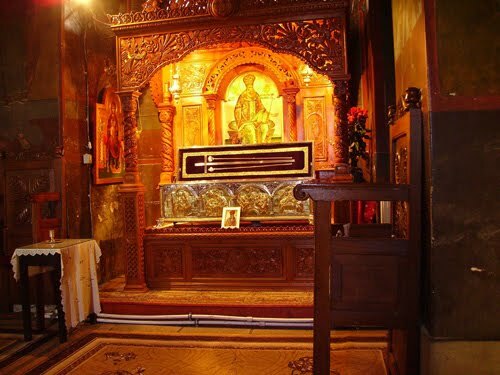 On 17 January 1973, the Archbishop Antim Nica of the Lower Danube (from Galaţi) decided the holy relics to be moved in the Monastery of Cocoş from nearby. They are still in this monastery, being venerated by the all Orthodox Romanians. Over the martyrikon ther it has been later in the ‘80s a building which covers both the crypt itself and the ruins of the church, together with some findings from here. Bishop Ephrem of Tomis (the province’s metropolis), killed in on March 7, 304, was the first Christian martyr of this region, persecuted and killed during the repression ordered by emperor Diocletian. His feast is made on 7th March, together with the Martyrs in Chersones, where all died as martyrs. Saint Sava from Buzău, even if he died in the region occupied at this time by the Goths, in the actual central-eastern Romania, may be mentioned here. He was drowned in the waters of the Mousaios river (Buzău) by the orders of the gothic king Athanaric. His relics were asked by St. Basil the Great through a letter from St. Bretanion, the bishop of Tomis. 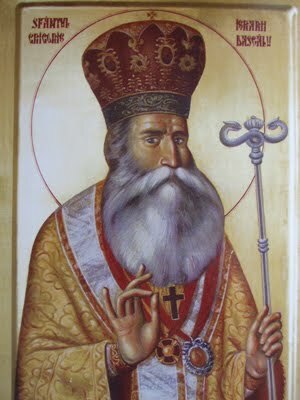 He is celebrated in the Eastern Churches on 12th April, and in the West, on 28th April. He is important also because of the attestation of the Christian faith in the “pagan” regions beyond the Danube, so not in the Roman Empire. Soldiers Pasicratus and Valentinus, died by beheading during the persecution of Diocletian in the city of Durostorum (today Silistra, in Bulgaria), in 298. Their Feast is on 24th April. Soldiers Cyril († 20 nov. 303), Kindeas /Candea (20 nov. 303) and Tasios/Dasius (20 nov. 303) from Durostorum (today Silistra), are together celebrated on 26th April. About Dasius we know that he died during the feast of the Roman Saturnalia, because he refused to play the role of Saturn at the feast celebrated here by the Legion XI Claudia. Maximus, Quintilianus and Dadas from the village of Ozovia (Ozobia) were probably Romans by name, only Dadas maybe Dacian. Maximus was lecturer in the Church. They were brought to Durostorum, beaten and finally beheaded on 28th April 204. Iulius the Veteran was contemporary with Pasicratus and Valentinus and died by beheading during the same persecution on 27 May 304, also in Durostorum. 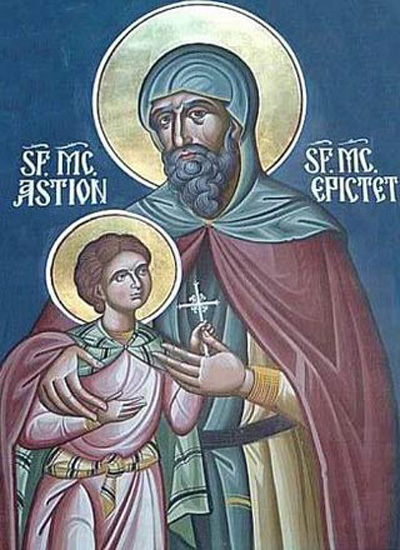 Epictetus, the priest and his apprentice, Astion the hermit, originals from the Small Asia, are celebrated on 8 July. 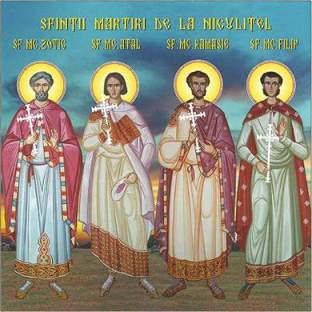 They died as martyrs about in 290 BC, being from several years missionaries in Scythia Minor, in the City of Halmyris (today the village Dunavăţul de Jos), on the shore of Danubius. The Governor Latronianus tortured them terribly and finally ordered the beheading of them. They may be the first martyrs in Scythia Minor known today. In the Martyric Act of them (which is today to be found only in a copy from the 15th century in the Church of the Saviour from Utrecht), there are described the bodies of the two beheaded saints, as snow-white. The sick people used to kiss their relics and were sometimes healed. The Basilica from Halmyris was discovered in 2001 and also the Holy Relics of the Saints here, which are today in the monastery built here. Part of their relics can be found also in the Cathedral Church of the Archdiocese of Tomis, in Constanţa. Emilianus from Durostorum, son of the Roman prefect Sabbatianus, was killed because he destroyed with a hammer the idols that he found in the city. Finally he died being threown in the fire, on 18 July 362.